ironSource pays developers their revenue earned from ad units in a monthly payment cycle; payments are issued by net60. Note: Your pending payment needs to exceed the amount of the transaction fee, which is subject to the payment type (for example, if the transaction fee for a wire transfer is $5, pending payment amount will need to be higher than $5). PayPal Funds will be transferred to your PayPal account. You will need to contact PayPal regarding withdrawals in your specific country. PayPal doesn’t support payments in all countries. You will also need to send funds to your local bank for use. Payments will be received in USD. Starting at $1. *Additional transaction and withdrawal fees from PayPal may apply. Wire Transfer Funds will be transferred directly to your bank account. Wire Transfer will get to you faster then other payment methods, but they also carry a higher transaction fee. Available in 29 countries. Payments will be received in local currency or USD. Payments in Euro : $11. Payments in USD: $14. *Additional Currency Conversion Fees may apply. eCheck/ Local Bank Transfer Funds will be transferred directly to your bank account. Fast and cost-effective, this payment method is best to use when you know your country’s banking requirement. Payments will be received in local currency or USD. *Additional Currency Conversion Fees may apply. When you define your payment method, you will also be able to set your payment threshold. In order to ensure you receive maximum payment amount with minimum transaction fees, you can accumulate your monthly revenue and defer payment to next month. Define your payment method (Paypal, Wire Transfer, eCheck/Local Bank Transfer). Your transaction fee will be calculated based on the payment method and the country you will be receiving payments in; in this example the Transaction Fee is $5. You set your payment threshold to $100 to minimize transaction fees. You start monetizing your app with our solutions in October and make $50 revenue. 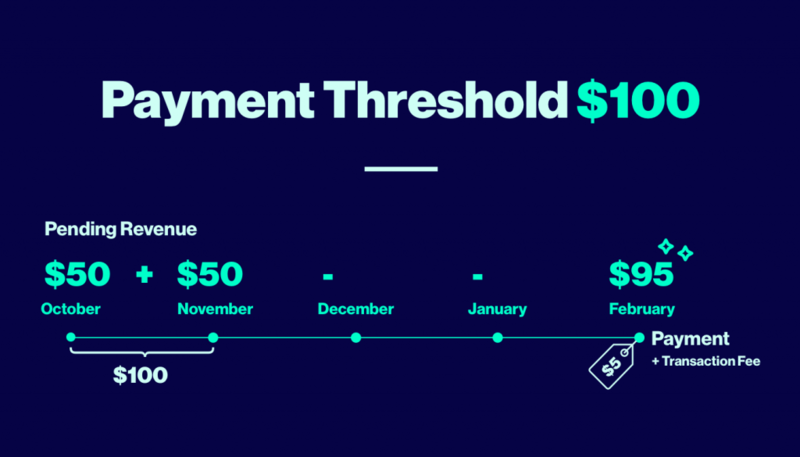 As your set your payment threshold to $100, this payment will be deferred to next month. In November, you earn another $50 in revenue. 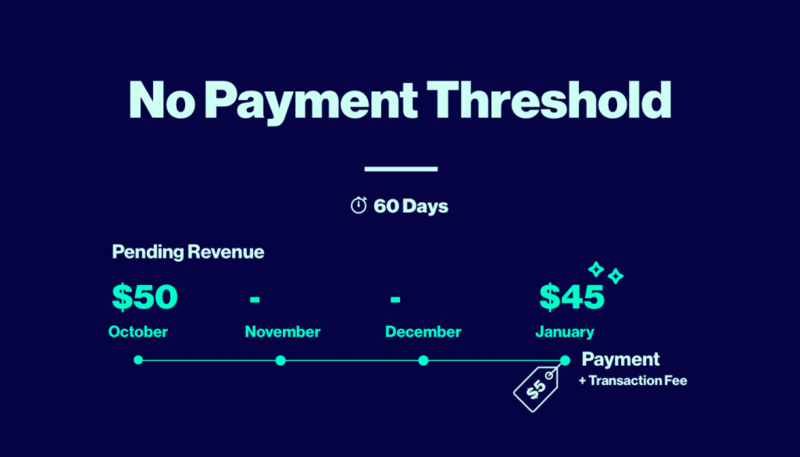 By February, ironSource will issue a statement for the accumulated revenue of October and November on your dashboard and you will receive $95 in revenue (assuming Transaction Fee is $5). In total, you receive $95 revenue for the months of October and November (you save $5 on transaction fees!). By January, ironSource will issue a statement on your dashboard and you will receive $45 (assuming Transaction Fee is $5. By January, ironSource will issue a statement on your dashboard and you will receive $45 (assuming Transaction Fee is $5). In total, you receive $45 revenue for your activity in October. Note: Your transaction fee will not be deducted from your payment when considering your payment threshold, for example, your payment threshold is $200, and your pending payment is $200, with a transaction fee of $6. Your payment will still be considered as above your payment threshold. We reserve the right to cancel accumulated revenue if it has not reached the threshold for six months. See our Terms and Conditions for more information. To learn how to set your preferred payment method on your Finance dashboard, go to the Payment Method Setup article.